My brother and his kids were visiting from Rhode Island last week. They have not had any experience around bees, so I figured I’d give them a whole hearted introduction by harvesting some honey while they were here. My niece was particularly uncomfortable by the idea of bees buzzing about. 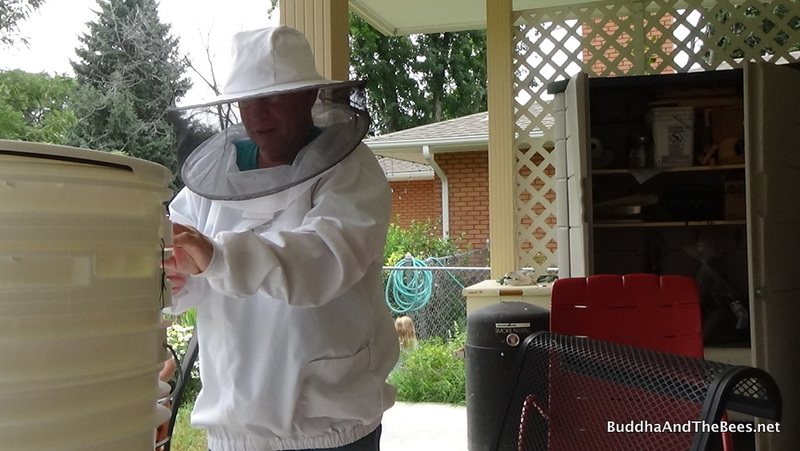 On the first day here, she was worried about sitting on the back porch for fear of bees. So I took on the challenge to hopefully show her that bees are not scary and they can give you a yummy treat. During our last inspection, I marked a couple of bars in BnB2 that were almost full of capped honey as ones to harvest while my brother was here. I figured they would be fully capped by then and they didn’t disappoint. In addition to my brother and his kids, we invited Duncan and his sisters (and dad – mom was at work) over to join in on the fun. It was quite the family affair – my brother was the videographer, Duncan was the smoker, and Diana was my lovely assistant. 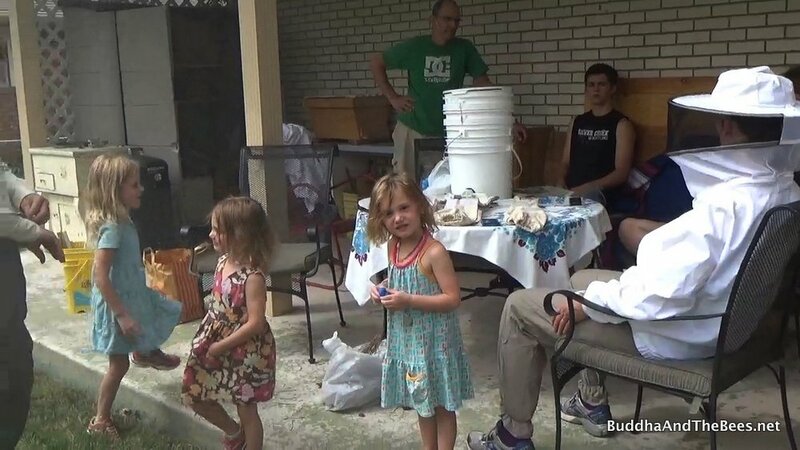 The rest of the crew sat on the porch in the peanut gallery until it was time to process the honey. In the past, when I’ve harvested honey, I’ve taken a bucket out to the hive and cut the comb there, but that always turned into a mess and a lot of dead bees. This time, I had the idea to move the combs into my little nucleus hive (“nuc”) and then cut the combs back in the garage. That turned out to be a much better way to do it. Here’s a clip of the actual harvest. After harvesting, we moved into the honey processing room (aka: our garage). With top bar hives, you can’t really spin the honey out like you can with Langstroth frames, so you have to harvest both the honey and the wax. Wax is a precious commodity to the bees (more so than honey in some ways), so it is a bit of a stress on the colony. Bees must consume about 8 pounds of honey to produce 1 pound of wax. It’s best if you can get them to store honey in old wax that needs to be harvested anyway (due to the buildup of pesticides), but sometimes they just put the honey in new wax. In this case, the honey was on new comb, but my hive has an abundance of both honey and comb, so I’m not depleting their stores completely. The crush and strain method involves cutting the comb from the bar and then crushing it by hand. I could also have cut some chunks for comb honey, but I decided to crush all of it this time. My son has been doing a lot of weight lifting lately, so we let him be the “crushinator”. The resulting slurry of crushed comb and honey is then poured into another bucket with a paint strainer and the honey is allowed to drain into the bucket. Duncan and his sisters really enjoyed helping out as you can see in the video below. We let the honey strain for a couple of days while I showed my brother and his kids around Colorado. 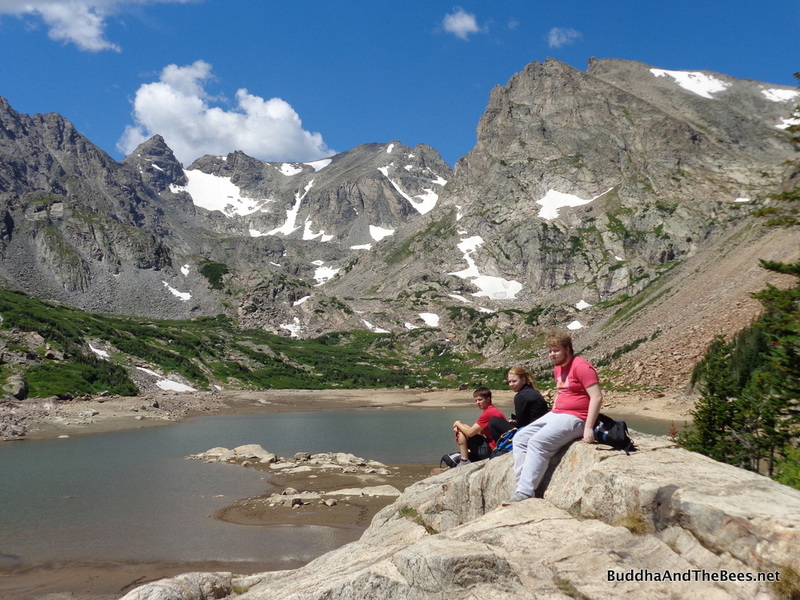 We took a wonderful hike up in the high alpine mountains just west of our house and drove to the top of Mt. Evans (14,240 feet). After a couple of days, we poured out the honey into jars. 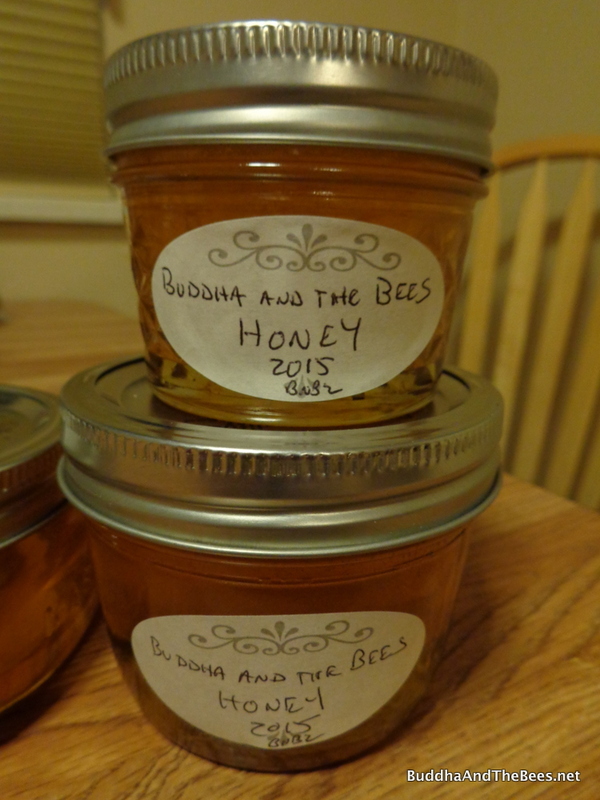 The end result was 1 gallon of honey from the 2 frames – quite a nice haul! And, my niece seemed to be more at ease with the bees – she even had her nose pressed right up to the observation hive at the county fair! Oh my goodness! You’re nieces are super adorable, and I love how their little fingers keep finding their way back into the honey bucket! So glad to hear you had a great visit with family, and congrats on the honey, too! You have some gorgeous honey combs there! Those are actually Duncan’s sisters so I guess they’re my surrogate “grand-nieces”. But I agree – they are darned cute and we all have a lot of fun together. They were all sticky by the end and their dad took them home and hosed them off. A fun time was had by all!